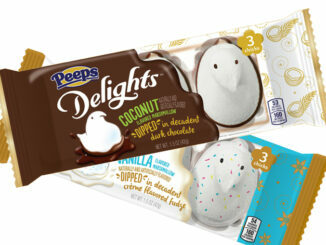 Peeps celebrates the 2018 holiday season with the arrival of new Peeps Giant Gingerbread Men as well as returning holiday-inspired flavors. Giant Gingerbread Men feature gingerbread-flavored marshmallow in the shape of a gingerbread man, dusted with brown sugar and decorated in traditional gingerbread man style. Each four-inch-tall giant gingerbread man carries a suggested price of $1.25. They’re also available in a case containing three giant gingerbread men.